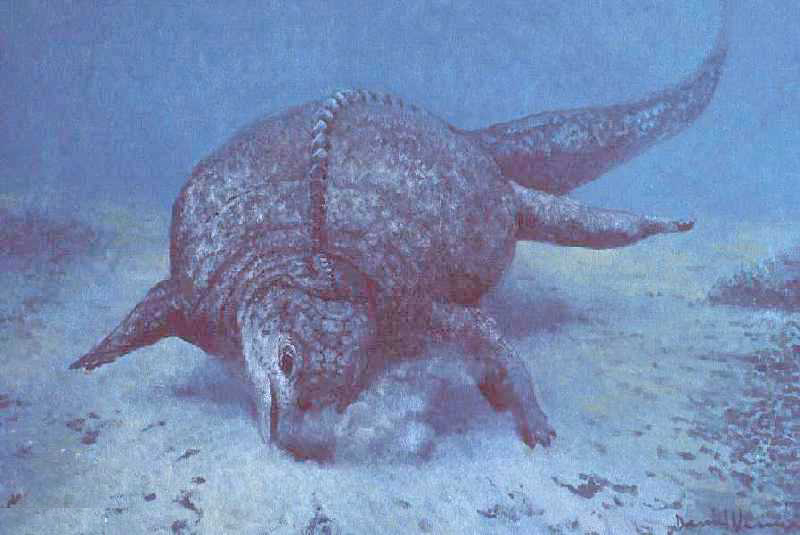 The Psephoderma isn’t actually a dinosaur it was more like a prehistoric turtle. Its name actually means “rough skin” and was part of the placodant group. In this group there were many other turtle like reptiles. Each of them with their own distinctive unique body shape. The Psephoderma was believed to live in the seas around Southern Europe between 223 and 209 million years ago (Triassic period). It weighted up to 400lbs and was 5 feet in length at most. Like I said turtle like, this would include a shell on its back, another over its hips, and a beak. Scientists can assume from its rounded teeth that the Psephodermas’ diet consisted of a lot of shellfish.